CYONARA RTS: 32 oz jug with Hose End Sprayer top. 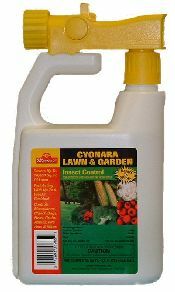 Good for a wide range of pests in both the yard and garden, Cyonara RTS is both low in odor and highly effective. Just hook it up to your garden hose and it's ready to spray. Coverage per quart will be from 8,000 to 16,000 sq/ft which is roughly 1/4 to 1/3 of an acre.